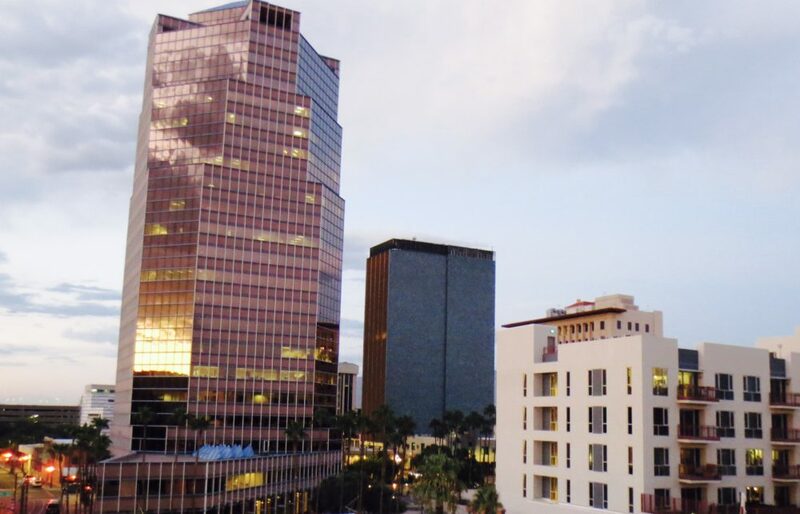 One of our areas of expertise is student housing near The University of Arizona, this market has drastically been changing in the past several years with projects getting larger and closer to the university. 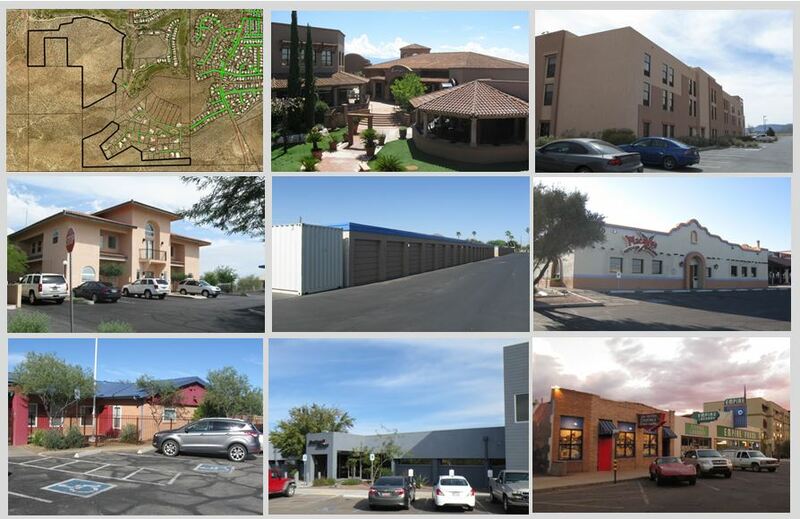 The University of Arizona currently has 23 residence halls and one graduate apartment complex, La Aldea. The 23 residence halls currently have a capacity for 6,612 students for the 2017-2018 academic years, while La Aldea Apartments has a capacity for 313 students. The new Honors Village will house another 1,056 students, expected to open by fall of 2019. The Honors College complex that is described as a “campus within a campus” cost about $137 million. The project is designed to have one area for Honors students to sleep, attend classes, eat and socialize. Enrollment at the University of Arizona has typically grown by 2% a year in the past decade. For the academic year of 2018-2019, total student enrollment was 45,217, an increase of about 0.86% from 44,831 students in 2017-2018 school year. Due to growing enrollment, coupled with state cuts to university funding, made the availability of space for students a matter for private developers, since universities could not afford to build student housing. The first private student focused complex to be built in Tucson was Northpointe Student Apartments, on Wetmore Road just north of Limberlost Drive, in 1998. At that time that was the closest developers could get to the U of A campus due to height restrictions in the city’s core. However, in 2012 the Main Gate Urban Overlay District was established to stimulate development along the route of the modern street car and these restrictions were lifted. Soon after its passage, the first student-housing tower, The District on 5th, was opened in August of 2012. The District, on 5th at 248 East 5th Street is a student housing project just west of the University of Arizona. Since the District on 5th opened in 2012, 7 very similar student housing towers have been completed and are in full operation. Currently, there are six student housing projects under construction and four more proposed. The four under construction are Hub 3, Aspire Tucson, The Mark at Tucson, and the new U of A honors campus. At a minimum, with six under construction and four proposed student housing projects, 3,000 bedrooms plus will be added to the student housing market over the next few years. 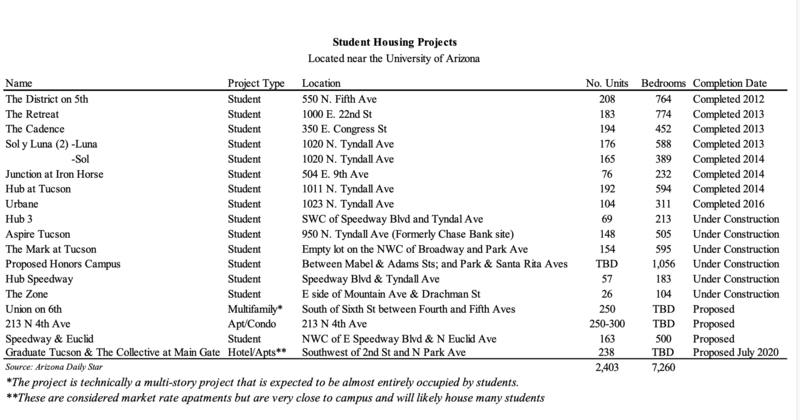 Additionally, numerous “mini-dorms” are being built around the U of A campus. These mini-dorms typically house anywhere from 10 to 50 students. These buildings are typically constructed from ground up or are converted houses/ apartments that have been extensively remodeled. Over the past few years, student housing projects have gotten closer to campus and the market is more competitive than in past years. Please refer to the following table for details.